For cooking seafood fondue recipes you need a metal fondue set as it needs to take the heat of boiling oil. Also a word of caution - now I realise I'm not your mother, but look at that sentence above 'boiling oil'... be careful and warn your guests and above all, keep the pot well away from children and animals who could knock it over. Move it into the centre of the table and think about having just a heat mat underneath it rather than a cloth if you do have kids or pets. OK then - lecture over and on with the recipes. So, set up your fondue (you could always substitute a deep fat fryer) half fill with oil, switch it on and get your party going. A mixed seafood platter would make a good centrepiece - arranged attractively on an oval dish. Use separate bowls for your ingredients that are going to be cooked. 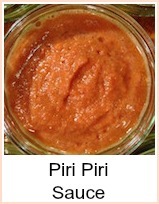 Supply a mixture of sauces to dip as well. 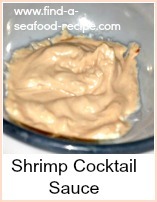 Try tartare sauce, thousand island dressing, mayonnaise or your favourite seafood dips. 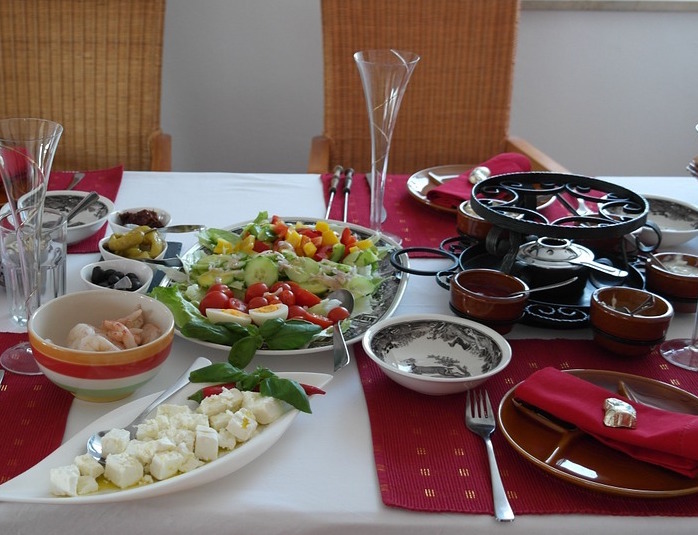 Arrange the table with salads, olives, sun dried tomato and other nibbles. Do not use plain white fish - it will flake in the oil as it cooks. The exception to this would be if you were to use a batter - maybe Japanese Tempura batter would be a bit light as it's not made to coat the fish entirely - you might try one of the batter recipes that I have - you will find it on the 'Fried Seafood' section - it's best to buy it ready battered if you can. Cubes of bread can be fried in the fondue - drop them in and when they float, they're cooked. 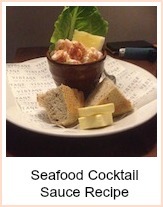 Other ideas for you to try with your seafood fondue are vegetables. They need to be small - bite sized really. Don't use something like tomatoes that would split and spoil the oil. Have a look in the frozen section at your supplier, to see if there are any other things you could use - maybe cod bites. Check the instructions on the individual packets for cooking times - but generally a minute or two will be enough. You also need to bear in mind that with all your guests thrusting their cubes of fish or bread into the oil at the same time, the temperature of the oil is going to be brought down and the cooking time will be extended. Just use common sense - there are no 'law suits' pending here - give each other advice on if it looks cooked and err on the side of caution. Serve with a selection of salads and some dips - you'll find some great dips just below here. Have some crusty bread cut into slices and let people help themselves. Maybe a couple of bowls of pickles and olives - just let your imagination go. If you like, have some fizzy wine or mineral water. 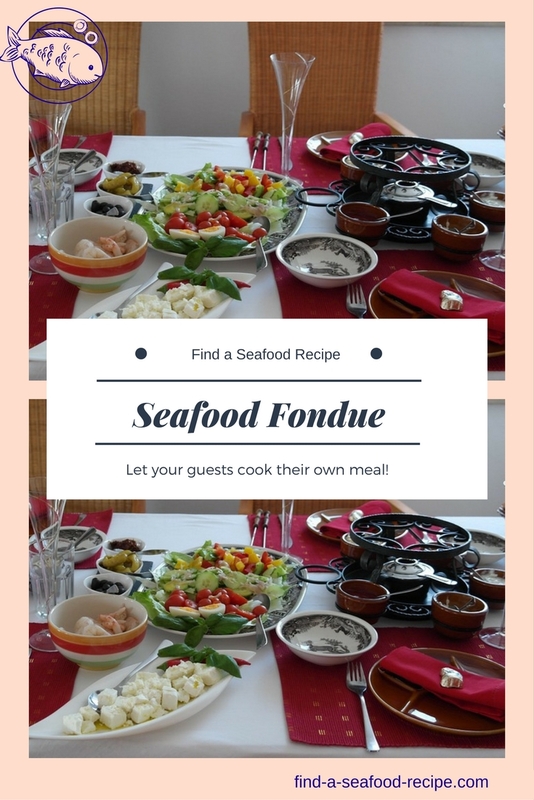 Great for a buffet party, these seafood fondue recipes will have you going back to the 1960s before you can say 'knife'.